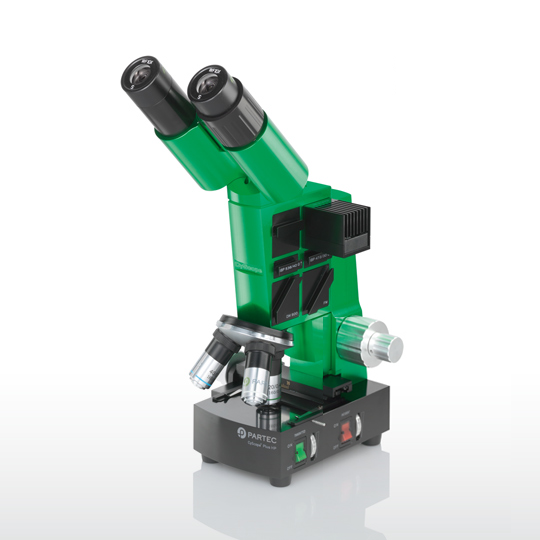 The CyScope HP is a uniquely innovative microscope, offering LED fluorescence and light microscopy in a compact design and implementing sophisticated optics. It employs incident light (e.g. UV, royal blue, blue, green, red) and transmitted light detection, either simultaneously or separately. The blue (470nm), green (528nm) and red (624nm) LEDs with their extremely long life of several thousand hours work in a high-power / high-current mode, cooled by a miniature fan. Additional microscope variations are available upon request.